Nothing goes better with the summer sun than a game of baseball. But truly dedicated players and fans won't let a little chill in the air stymie their enthusiasm for the game. Or at least, they didn't for a few select games in the mid-1800s. The first known example of playing baseball on ice dates to January 1, 1861 when two local teams in frigid Rochester, N.Y. clashed on skates before a crowd at least two thousand strong. Later that same year, the Brooklyn Atlantics hosted their own ice-bound game, beating the Charter Oaks 36-27 in a poorly defended match, after which the Brooklyn Eagle neatly surmised that "the most scientific player upon the play ground finds himself out of his reckoning when he has got the runaway skates to depend on, and the best skater is the best player." 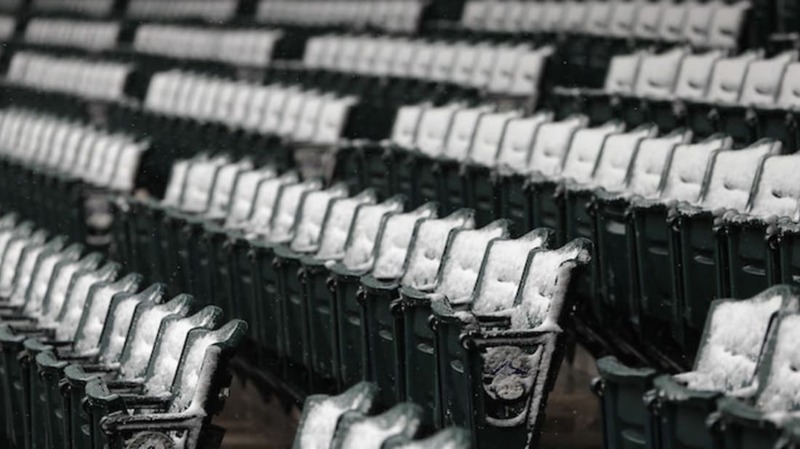 But baseball was burgeoning and even the cold couldn't suppress the sport's growing popularity. Nearly 20 years after those complaints about baseball on ice, the game returned in the winter of 1884. The sport was still in its nascent stages—rules were in flux and there were three leagues jostling for Major League status. One of the more popular venues was Washington Park in South Brooklyn, home of the Atlantics, who would join the Major League American Association later that year. But in January, with winter well under way, the conditions at Washington Park were hardly conducive for lush outfield or diving catches. To keep the public entertained, and the baseball fervor alive through the winter freeze, the diamond was turned into a skating rink and a game was played on ice. There were at least two such exhibition games played at Washington Park that month, both featuring one team of amateurs assembled by early baseball visionary and "father of the game" Henry Chadwick against a pro team, and neither of which featured remotely decent defense. This despite the fact that a 10th man was added to play a sort of auxiliary shortstop between first and second base. In the first game, played on January 12, Chadwick's assemblage out-skated the Brooklyn team to seal a lop-sided 41-12 victory after scoring 27 runs in the final frame of the five-inning game. Together, the two sides combined for 15 errors. Later that week, the pro team, captained for the day by Baltimore's Billy Barne, prevailed over Chadwick's team with the slightly more reasonable score of 16-8. And although there were still 12 errors in the game, Barne insisted he and his "steel-shot players" were ready to take on any team in the country. It's unclear if he ever had a chance to do so before the ill-fated baseball on ice fully died out in the 1890s. But even today, we honor at least one part of the fad's legacy. When the rules for the hybrid sport were codified in 1887, they included a provision that "each base runner makes every base simply by overrunning the line of the base," since skating made it so difficult to stop short. Although you have to pull up at second and third these days, some historians trace our modern practice of overrunning first to those icy days.